Creating a base with live evergreen boughs, then building up the campfire with dry wood of different types, including plenty of hardwood, helps create a good bed of coals for cooking. Here’s how to build a foolproof campfire for cooking. There are many methods for building a fire, some admittedly better than others. This method is taught by instructors at the University of Maine 4-H Camp & Learning Center at Bryant Pond. It’s used to teach students of all ages how to build a backcountry campfire for cooking meals over open flame. The key is in building up hot embers, so if you’re using a fire pit, the idea is the same — you’ll just need fewer materials. 1. Create a bed of fresh evergreen boughs. When collecting these boughs, try to practice Leave No Trace principles by gathering boughs from multiple sources or newly downed trees. 2. Add a layer of sand over the boughs, if you have access to it. 3. 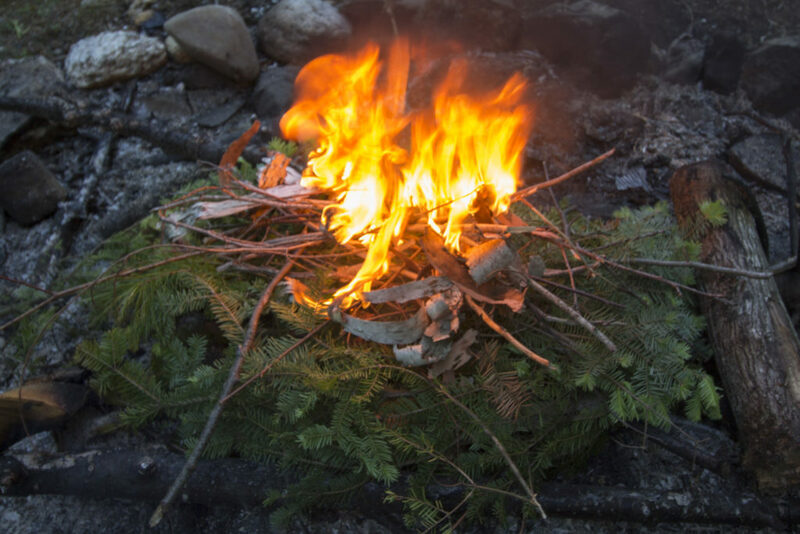 Build the base layer of the fire by placing large logs on the edges, creating a rectangle. These logs act as a barrier that will keep the coals from rolling away. 4. Start the fire using birch bark, newspaper, lichen, pinecones and twigs as the base. 5. Add increasingly larger twigs, sticks and then logs as your fire grows. 6. Build up a good base of coals by burning a few loads of logs over the course of a few hours. 7. Put a grate on the fire and test your temperatures. The most common way of testing the temperature of your coals is by holding your hand 1 to 2 inches above the cooking grate — or 4 to 5 inches above embers — and remove when it starts to feel uncomfortably hot. If it’s less than 1 second, the temperature is around 600 degrees Fahrenheit; 1 to 2 seconds, 400 to 500 degrees Fahrenheit; 3 to 4 seconds, 350 to 375 degrees Fahrenheit; 5 to 6 seconds, 300 to 350 degrees Fahrenheit. Or you can purchase an infrared thermometer that can actually read the temperature when pointed at the fire. 8. You’re now ready for campfire cooking. Simply adjust the height or location of the grate on the fire to control the temperature for your particular recipe.